After years of trying multiple means of controlling the time Sanjiv Handa wastes takes up at City Council meetings, on Tuesday night the City Council passed rule changes that might finally accomplish that goal. This is great news. The Council will start its ceremonial items at 5:30pm and hopefully end those and the consent calendar by 6:30pm. Even when they’re running late with long ceremonial items, they should at least start by 7pm. This will be a welcome change, since in the past, when ceremonial items dragged on, the Council sometimes didn’t get started until 7:30 or 8pm. The adjournment time change is really no change at all, just an acknowledgment that the Council almost never ends by 10:30pm (maybe once or twice a year they do). It’s pretty silly that at basically every meeting a motion has to be made to extend the meeting, so that will now be done away with. But with the new rules on speaker limits, Council meetings could potentially end before midnight! If you’ve ever seen a Council or committee meeting, you know that Sanjiv Handa takes up a LOT of time at these meetings. He signs up for every single item and gets to speak for two minutes on each item. Sometimes the meeting chair negotiates with him and gets him to take all of his time at once and speak for a slightly shorter amount of time total. No matter what the chair does though, Sanjiv regularly takes up 45+ minutes of Council meetings and 20-30 minutes of committee meetings. It’s maddening. And lately, David Mix has been joining him at every Council meeting so that together they end up taking up an hour and a half of each meeting! It might make them feel like they’re sticking it to the Council and standing up for Oaklanders, but their main effect is to turn people off by making the Council meetings run on and on until everyone who’s not paid to be there goes to sleep. Speakers who submit more than 4 speaker cards (excluding open forum) will be given 2 minutes per card up to a maximum of 10 minutes. If all speakers are given 1 minute, speakers with 4 or more cards will be given a maximum of 5 minutes. Speakers will have one minute per scheduling request up to a maximum of 5 minutes, provided that total time on all items on the Rules agenda (excluding open forum) for each speaker shall not exceed 10 minutes. Speakers are allotted a minimum of 1 minute and a maximum of 3 minutes (no change). Speakers with multiple cards will be given 2 minutes per item up to a maximum of 6 minutes (excluding open forum). If 20 or total cards have been submitted, speakers who submit 4 or more cards will be given 2 minutes per item up to a maximum of 10 minutes. What does this mean? Let’s take Tuesday’s Council meeting for example. Under these rules, Sanjiv Handa and David Mix would have each been able to speak for 1 minute during Open Forum, 6 minutes during consent, and 10 minutes during non-consent. They would have each received a total of 17 minutes, or 34 minutes combined. This would have made Tuesday’s Council meeting an hour shorter! Handa and Mix argued that limiting speaker time closes access to the government, and Councilmember Desley Brooks agreed. But this argument is based on the assumption that two people rambling for an hour and a half (longer than most of the elected councilmembers speak at a meeting!) equals open government. Sure, it opens the government up to two people, but it closes it off to everyone else. The Council and their staff get paid to sit through those ramblings, but the rest of us don’t. So when we get tired, hungry, or just can’t take it in anymore, we leave City Hall or turn off our computers and TVs. If you follow Council meetings on Twitter, you’ve probably noticed that between 7pm-9pm, there are several people tweeting the meeting. At 9:30 or 10pm, one or two drop off. By the time 11pm rolls around, it’s rare that even one person is left tweeting. Why? Well, for me, I have a job to get to in the morning and unless there’s something really exciting on the agenda, I can’t justify staying up so late. With the new rules, I’ll make it through most meetings, and I bet others will too. As Brooks noted, it’s unlikely that many more people will speak at meetings, but that’s not the only important part about open government. More importantly, people will be able to sit through the whole meeting (or come close to it). More of us will know what happened at the Council, either by watching or by following on Twitter. Thanks to Councilmembers Brunner, De La Fuente, Kaplan, and Kernighan for introducing these changes. I look forward to watching entire Council meetings and to having to use my mute button a lot less frequently. Instead, I’m taking a page from V Smoothe’s book and will share with you Twitter coverage of yesterday’s budget meeting. Though not a lot of new ideas were proposed, I’m glad this meeting was not delayed until January because the Council did approve some staff suggestions and gave staff direction on various other proposals. Hopefully the January budget meeting will be more productive because of this. If you’d like to see the full budget meeting, it’s only 2 hours and can be viewed online or downloaded. OaklandBecks: Council budget mtg just started and @Vsmoothe speaking at open forum about KTOP online streaming being down. OaklandBecks: She’s also saying it’s difficult for people to watch this budget mtg because it’s at 10am and people don’t have Comcast at work. OaklandBecks: City Administrator Lindheim explains that server has crashed and it will cost $25K to fix. They’re trying to fix it. OaklandBecks: Lindheim also says it will be improved – currently only allows 250 connections and will allow unlimited connections. SeanforOakland: @OaklandBecks Someone tell Lindheim to move the server to 365 Main in JLS and this won’t happen. OaklandBecks: Now @MaxAllstadt is speaking. Suggests taking back $182K from Chamber of Commerce for Chiodo sculpture. OaklandBecks: Staff – most of our budget “solutions” are one time funds and fund transfers. OaklandBecks: City Administrator doesn’t recommend spending reductions – so little time left in fiscal year that it wouldn’t make difference. OaklandBecks: Also, these spending reductions would decimate services, like closing 6 recreation centers or elimination of all IT support. dto510: The problem with selling assets isn’t just that prices are low, it’s that sales wouldn’t close for a long time. OaklandBecks: Lindheim – to close budget gaps w/o one-time solutions, we need further revenue. Asks Council if they’d put rev measures on ballot. MaxAllstadt: Why isn’t anybody discussing the possibility of selling one of our 3 golf courses? OaklandBecks: Parks advocate – don’t dismember the already skeletal parks staff we now have. Many parks don’t even receive routine maintenance. MaxAllstadt: Local 21 rep wants a freeze on hiring to replace early retirees. Demands in house promotion where replacement is essential. OaklandBecks: Kernighan – we can’t put this off forever with one-time money – we’ll eventually have to make drastic cuts. OaklandBecks: Kernighan – police/fire budgets growing as general fund shrinks. Eventually have city that’s nothing but police/fire if continues. OaklandBecks: Kaplan again recommending more billboards on freeways and more medical cannabis facilities as way to create ongoing revenue. OaklandBecks: Kaplan – permit more medical cannabis dispensaries & permit growers for increased revenue. Permitting growers is way overdue! OaklandBecks: Kaplan also suggests increased local vehicle registration fee for funds for road repair (which Oakland’s streets desperately need). OaklandBecks: Quan – Mayor’s office, IT department, and police need to come within budget (they’re currently over budget). OaklandBecks: Quan – should do citizen’s survey on funding & revenue priorities. Sounds like city-funded research for her mayoral campaign. OaklandBecks: De La Fuente increasingly concerned about structural deficit that we’re not addressing. We haven’t had political will to make cuts. OaklandBecks: De La Fuente says we should sell golf courses. We’d get immediate cash and they’d be managed better. That was @MaxAllstadt’s idea! MaxAllstadt: We should sell a Golf Course: lock in huge ad valorem tax, mandate subdivision + development within 10 years, create more ad valorem tax! OaklandBecks: De La Fuente – we need to deal with pensions or the city will go bankrupt. We need union/city comm to look at pension problem. OaklandBecks: Brooks doesn’t think public would respond well to new tax measures since city hasn’t handled Measure Y well. OaklandBecks: Nadel agrees with Kaplan on permitting & taxing medical cannabis growers but concerned about increased billboards. OaklandBecks: Why does Brunner never understand staff reports? She’s asking questions about something that was incredibly clear. OaklandBecks: It seems so simple to understand that while $3.2 mil unspent exists, we can’t touch it because it’s committed already. OaklandBecks: The CMs keep talking about cutting everything that is not core. But none of them have explained exactly what is core. OaklandBecks: Many of them seem to agree that the city can’t afford to fund non-profits, outside of what’s required by ballot measures. OaklandBecks: Brunner says we need June ballot and it should be public-safety measure. People won’t vote for this after Measure Y failure. OaklandBecks: Also, June ballot initiatives negate potential IRV savings. We wouldn’t have to pay for June election if we don’t have initiatives. dto510: @OaklandBecks Is that you pointing it out, or CM Brunner? OaklandBecks: @dto510 That’s me pointing it out. It apparently either hasn’t occurred to her or she just doesn’t care. OaklandBecks: Kernighan wants to see anticipated revenues & expenditures for next 5 years at next budget mtg to help decide about tax measures. OaklandBecks: Kernighan – before we go for ballot measure, must cut everything public sees as a waste. OaklandBecks: Kaplan wants to see Measure Y revision on ballot but prefers Nov ballot. Not saying this, but she’s thinking about IRV. OaklandBecks: Kaplan – who authorizes police standing around watching peaceful protestors like lockdown of City Hall Tues due to trucker protest? Vsmoothe: @OaklandBecks Yes, who does authorize that? I had to fight for a long time to be let in for Finance Committee on Tues. Ridiculous! OaklandBecks: Council approves staff recommendations to close part of budget & tells departments to stay w/in budget or come in Jan to explain. Disclosure: I am working on a part-time, short term basis for TransForm on the Oakland Airport Connector campaign. However, the thoughts expressed in my posts on this subject are my own and should not be construed to be those of TransForm. Yesterday, the Oakland Public Works Committee meeting got off to a rough start for BART and stayed that way throughout the hearing on the Oakland Airport Connector. Chairwoman Nancy Nadel began the hearing by asking BART to respond to the questions that the committee sent to them last month. Tom Dunscombe, project manager for the OAC, stumbled, explaining that he had not prepared a presentation but that he was prepared to answer questions. (A kind of odd thing to say, considering the committee had already sent him the questions to which they wanted answers.) So Molly McArthur, a BART spokesperson who I’d never seen at an OAC meeting, stepped in and read off of the response BART had sent to the committee (a very late response that councilmembers did not see until Monday morning and that did not make it into the public packet). I nearly jumped out of my seat to begin debating her on this claim, but instead I just wrote a bunch of exclamation points next to her remark in my notebook. I guess I shouldn’t be so surprised, since I’ve heard this before. Alameda County Supervisor Scott Haggerty (yes, the same one who is now a Democrat) said something very similar at the last ACTIA meeting on this project. But I could not believe that BART would say this to a committee of the Oakland City Council – it is so disrespectful! FURTHER RESOLVED: that the Oakland City Council urges our regional transportation authority (Metropolitan Transportation Commission) to reconsider using the $70 million in federal funding for the current BART OAC project, and instead prioritize funding for local bus system improvements and a more cost effective and environmentally sound airport connector alternative. After Molly spoke, Councilmembers Kaplan, Nadel, and Desley Brooks explained briefly what they think is wrong with this project, focusing on how the stimulus funds could better be used for BART and AC Transit operations, which would help the agencies avoid some of their service cuts. Brooks had to leave early to get to the Alameda County Supervisors to speak out against the rapid appointment of a District Attorney with no process (a hearing which didn’t go as well) so she moved the resolution, Kaplan seconded, and Brooks registered her yes vote before leaving. Then the public took to the microphone to speak about this project. Seventeen people spoke against the OAC and for the resolution, including many Oakland residents, BART union members, AC Transit union members, transit advocates, and social justice advocates. The six people speaking in the support of the project mostly represented the building trades. Whether the time saved over the current AirBART or the proposed BRT justifies this very large expense. The likelihood of the BART core system having to subsidize the OAC. Whether spending money on the OAC would take money from other transit projects. The meeting ended with the committee directing that the resolution come before the full council on Tuesday October 6th and asking Oakland Public Works staff to provide a neutral analysis of the OAC. “It’s shovel ready. In one week from today we’re receiving proposals on this project and we are prepared to move forward with construction,” said McArthur. Translation: Oakland can say all it wants, but in the end, we’re building this project no matter what. So clear your evening for October 6th. We need you down at Oakland City Hall for a showdown on the OAC. We need to tell BART that Oakland does have a stake in this project and that it does matter what we think. We need to make it clear why a $550 million project that is sucking money from other transit projects, won’t be much quicker than the current bus, won’t spur economic development, and is not guaranteed to provide jobs to Oaklanders is unacceptable for Oakland. Disclosure: I was recently hired to work part time on a short term basis for TransForm on the Oakland Airport Connector campaign. However, the thoughts expressed in my posts on this subject are my own and should not be construed to be those of TransForm. On Tuesday morning, the Oakland City Council, via the Public Works Committee finally had a chance to review the Oakland Airport Connector (OAC). The last time they had reviewed the project was in 2006, and it has changed greatly since then, with projected ridership plummeting and costs growing. And the Public Works Committee members seemed to understand this well, asking pointed questions of BART and agendizing the project as an action item for their first meeting in September, when they return from recess. The first page has renderings of the OAC stations that are entirely inaccurate now. The airport station shows a covered walkway directly from the station to the terminal, even though this was taken out of the project due to costs long ago. 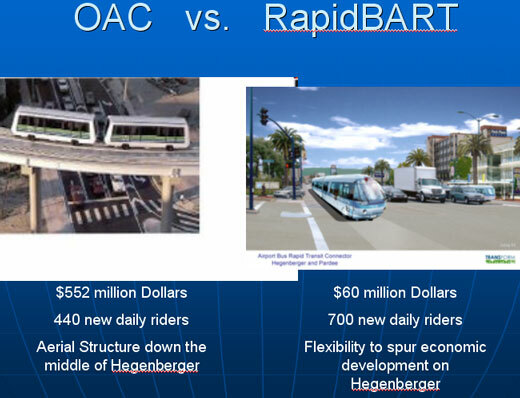 There is one slide that mentions the rapid bus alternative that TransForm has proposed and then says that BART studied it and it doesn’t work. There is no more information provided on this. After the two presentations, several Oaklanders spoke about the need to study alternatives and why the current OAC is not the best project for Oakland. dto510 presented the committee with V Smoothe’s awesome presentation about financing. If you haven’t read it yet, check it out right away, as its some of her best work yet (which says a lot). A few OAC supporters also spoke, claiming the OAC was good for business and labor. What happens to the funds if they don’t go to the OAC? What are the operations costs? She asked for a clarification of the Port’s position, since Commissioner Margaret Gordon spoke and said the Port has asked for a study of alternatives and still has concerns about local hire requirements, and a Port staffer basically said the Port loves the project unequivocally. She asked for more comparison of a bus to the OAC, including pros and cons and wanted to know how a rapid bus would be different from the currently operating AirBART bus. Are any of the funds from voter approved measures specifically dedicated to this project? Desley Brooks followed, calling for the item to be re-agendized as an action item immediately to see if the City still wants to continue to support the project. She said that based on the information provided at the meeting and the letter from Don Perata, who was an early supporter of the project, she needed more information. Also, early in the meeting, before the presentations, she brought up concerns about hiring locally and hiring minorities, stating that BART has an atrocious record on these issues. Public Works Chair Nancy Nadel said she wanted to echo Kernighan’s questions. Particularly, she was concerned about high costs, high fares, and local jobs. She also wanted more information on how smooth the transition would be on each alternative. Nadel ended her comments by saying that her district (in West Oakland) is seeing enormous AC Transit service cuts, and ACT is able to accommodate more people at lower cost. She didn’t say this, but I assume she was speaking to the fact that the stimulus funds, if they didn’t go to the OAC, would be reverted back to the transit agencies, including ACT. Rebecca Kaplan, who has been a leader in fighting for a better connnector, spoke last. She explained that the stimulus money would not be lost if it was not given to the OAC, since it would be reverted back to the transit agencies. The only way it would be lost, she said, is if it is given to the OAC, since most of it would go to concrete, steel, and out of town jobs. She then asked for a legal analysis of BART’s 2006 contract with Oakland, which states that BART should give the RFP to Oakland before it is issued and allow Oakland 15 days to comment. BART did not follow this process and instead allowed Oakland to see the RFP several days after it had been issued. Kaplan brought up the possibility of a third terminal being built at the airport and explained that at a BART board meeting, staff said that the Port would pay for an extension to this terminal if it was ever built, which is not true. She agreed with TransForm that BART’s ridership numbers and revenue projections for the OAC include revenue from third terminal passengers but not the cost of extending the OAC to the third terminal. Kaplan ended by making a pretty incredible comparison about jobs creations. The OAC, which costs more than half a billion dollars, is projected to generate 350 jobs, while another project that was heard at Oakland’s Community and Economic Development Committee later in the day on Tuesday, which has a similar price tag, is projected to generate 5,000 jobs.